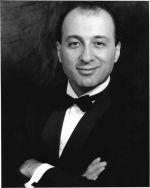 Alexander Kordzaia accepted the position of Music Director of the Charlotte Civic Orchestra in 2003. A conductor and pianist, he is a native of Tbilisi, Republic of Georgia. Born into a musical family, Mr. Kordzaia demonstrated great musical ability at an early age. At the age of seven, he began serious study of the piano and composition in Georgia’s premiere music school. By the age of 12, he was performing as a soloist with orchestras and was considered a child prodigy as a composer. Soon it was evident to his teachers that Mr. Kordzaia also had great talent and desire for conducting. By the time he graduated from the Tbilisi V.Saradjishvili State Conservatoire. Mr. Kordzaia was the Music Director and Conductor of the Georgia State Cappella and assistant conductor at the Tbilisi Opera House, the two most prestigious musical ensembles in the nation. Mr. Kordzaia led both of these groups on triumphant tours of the former U.S.S.R. He mooved to the United States in 1991 to further his studies at the Mannes College of Music and the Julliard School of Music, both in New York City. Since his arrival in the U.S., Mr. Kordzaia has performed and conducted orchestras to critical acclaim. Mr. Kordzaia’s recent engagements have included conducting the Cincinnati Symphony musicians for the American Harp Society National Conference, the Cincinnati Symphonietta, the Okanogan Symphony, Spokane, Washington, a European tour with the American Youth Harp Ensemble, and most recently, the Charlotte Civic Orchestra, Charlotte, NC. He appeared as an Opera Conductor with CPCC Opera Company, Charlotte NC. Alexander Kordzaia also served as Assistant Conductor of the Richmond Philharmonic Orchestra from 1999-2001 and Music Director of the Richmond Philharmonic Orchestra from 2001-2003. An active chamber musician, recent concerts have been in Washington, D.C., Maryland, and New York. Mr. Kordzaia is an active teacher/educator and classical music advocate throughout the Mid-Atlantic states. He is frequently invited as an adjudicator, music coach and to give masterclasses in schools and with youth music organizations throughout the U.S. He also has continued to be a frequent guest conductor and pianist in the U.S., France, Eastern Europe, and Russia.